Preamble warning: I’m not going to include any direct spoilers, but this 10 Cloverfield Lane review may give away some minor plot details. Consider yourself warned. If the 2008 monster movie, Cloverfield, also produced by JJ Abrams, is an allegory for the end of the Bush regime in the US – as Callum Petch eloquently explained on the latest episode of the Failed Critics Podcast – then it stands to reason that this thematic sequel would be a metaphor for Obama’s reign as President of the largest super-power in the world. Like almost all good creature-features, there is some semblance of truth in that suggestion. Whether we consider Godzilla and the Pacific ocean atom bomb tests, or I Am Legend for communism (well the novel was at least), District 9 for apartheid or even Ed Wood’s notorious b-movie Plan 9 From Outer Space and the nuclear bomb threat; these sci-fi thrillers are very rarely just about giant monsters, vampire-zombie things or alien invaders. Cloverfield was no different – and neither is Dan Trachtenberg’s directorial debut. Taken unconscious from the wreckage of a car accident by Howard (John Goodman), Michelle (Mary Elizabeth Winstead) awakens to find herself chained to the wall of a concrete room. Howard explains that he has saved her life, as the world outside of his underground survival bunker has been destroyed by an unknown force – possibly not even one of human origin. After meeting another survivor down in Howard’s bunker, Emmett (John Gallagher Jr), Michelle becomes even more suspicious of Howard’s apocalyptic claims. “Where are the creatures?” I don’t hear you cry, but imagine you are thinking to yourself. Well, actually, forget about the fact that I compared this to a bunch of creature-features. It’s still a post-apocalyptic sci-fi of sorts, with three people holed up in one small fallout shelter with what may or may not be the end of the world. One of whom may or may not be slightly unhinged. And with what may or may not be a metaphor for burying your head in the sand, looking out for only yourself and the consequences of ignoring the world around you. Thanks, Obama. Sure, all of that can be read into 10 Cloverfield Lane if you look for it. Should you find some extra comfort from observing a meta-text within this evenly structured, well paced and incredibly tense psychological thriller, then bully for you. I don’t intend to sneer at anyone who can’t or didn’t see the parallels with the political state of the world; it’s entirely plausible that I’ve read too much into the plot considering the comments that I read and heard prior to sitting down in my cinema seat on Friday evening. It’s quite likely that there may be some form of underlying thread running through the plot, and that it is about a transformational President’s attempts to change America, but that I’ve simply misinterpreted what that message is. Hell, to be quite honest, it doesn’t even matter if there is or isn’t a subtext, or if you’re aware of unaware of it. What is most impressive about this “blood relative” (to quote JJ Abrams) of the original Cloverfield, is that it stands on its own two feet as a solid, atmospheric, borderline-great modern thriller. You don’t even need to have seen the original film to enjoy this. The two films are only as linked with each other as one episode of Black Mirror or the Twilight Zone is linked to another. Take it as a straight-up one-off story about a potential doomsday scenario if you’d prefer, and you will still enjoy it as much as the next guy. It really doesn’t matter. On the surface, it seems as though the plot has been done a million times before, but I really can’t think of a film that it most closely resembles. Try and imagine Room mixed with that bit in War of the Worlds and melded with the paranoia of The Thing and I suppose you’re halfway there. Yet the beats are often unexpected and startling. John Goodman is fierce and pretty goddamn bonkers, a combination that serves to enhance the unpredictability of the plot. You are never quite convinced of the truth, but are constantly led to believe he’s both a firmly sincere gentleman and a downright liar. Coupled with Mary Elizabeth Winstead’s resourcefulness and A-Team-esque skills, alongside John Gallagher Jr (who does take a little time for you to warm up to), it’s a very strong cast whose individual character traits perfectly compliment one anothers’ excellent performances. The only thing you’re certain of is that they are all trapped in there together, whether intentionally or by circumstance, and it makes for some rather gripping drama. Cube! It’s also a bit like the fantastic little science fiction b-movie Cube. Sorry, got slightly sidetracked there. 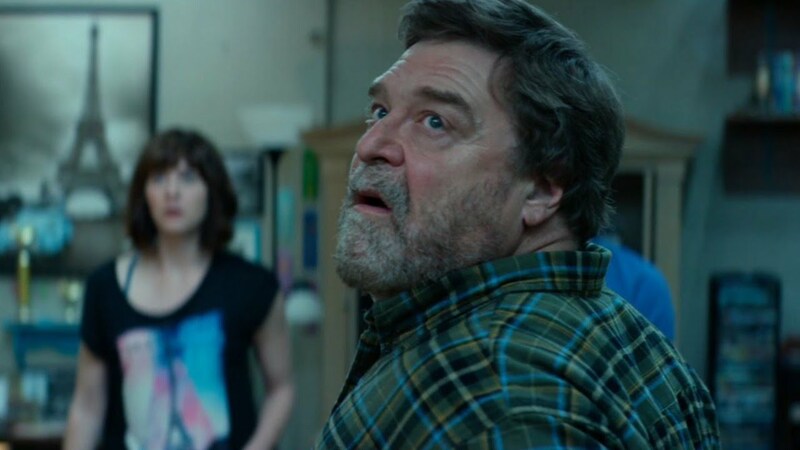 To sum up, 10 Cloverfield Lane is not an action-packed thriller full of Kurt Russell one-liners, but neither is it a dull, slow burning, contemplative chore. The action sequences, much like the tension, escalate to the point that the finale is as big a showdown (probably bigger) than one might expect from a film set almost entirely within one small bunker. Whilst acknowledging that dropping the found-footage angle does mean that a piece of what gave Cloverfield its distinctive quality is noticeably lacking – it really does feel like it’s all been seen before – nevertheless, it’s still unlike 90% of generic sounding, run of the mill blockbusters that are due out this summer and for that it deserves your attention.